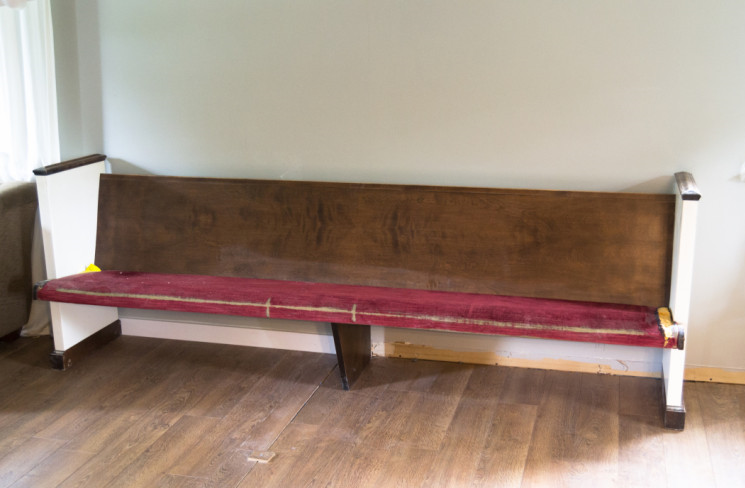 To Replace or Reupholster a Church Pew? The decision of whether or not to reupholster church pews or replace them is up to each church’s individual needs and capacities. Some chapels may only have a pew or two that could do with some new fabric and padding, while others may be looking at entirely new pews as part of a chapel face-lift. Regardless of your chapel’s needs, everyone benefits by saving time, which is why we’ve created this guide to determine whether your pew benches need new fabric or need to be completely replaced. Is the seat well-cushioned, or will I be uncomfortable five minutes into the sermon? Is the padding well-dispersed, or are there uneven bumps? Is the bench creaky/sound unstable? Does my seat rock, wobble, or shift when I take a seat, fidget, or stand up? Is the wood in good condition? Are there any cracks or splits that could potentially cause the pew to collapse? Is the fabric threadbare, thin, or torn? Is the wood worn or damaged in places? Be sure to consider how the different members of your congregation would experience the seating, including young children, those with handicaps, and the elderly. Some of the pew problems you will come across can be easily fixed, such as tightening the bolts holding them to the floor, while other issues will require more involved solutions such as restoring or replacing. If upgrading isn’t your first choice, you’ll need to spend some time assessing the condition of your pew. For wood pieces that have cracked or aged, you’ll want to replace them as soon as possible with high quality wood that will last. If you’ve found that some pews have experienced higher traffic, and therefore supported more weight and experienced greater wear and tear over the years, you can simply have the padding replaced with high-density foam and finish it off with new fabric. For churches who don’t have just one pew that needs help, but want to redo their entire chapel seating, it’s best to contact a professional company who works with the needs of congregations regularly, like Born Again Pews. The owners of Born Again Pews have the experience, skills, and desire to help each church find the highest quality furniture to fit their needs and enhance worship services for years to come. They are happy to discuss your needs and answer any questions you have about refurbishing or replacing your church pew furniture. With Born Again Pews, you will find a partnership aimed at furthering the ministry of Christ through affordable, personalized church furniture that will create the atmosphere you’re looking for while bringing comfort to your congregation.